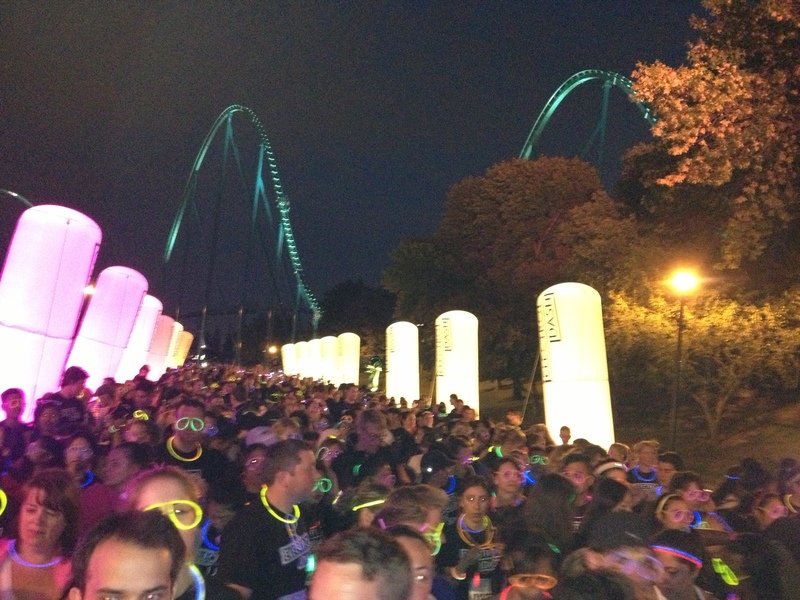 About a week ago, a friend of mine forwarded an email from one of those group buy-in sites that was advertising the Electro Dash 5K at Canada’s Wonderland for half the price. It was $30! So we opted in and registered. We thought it would be fun to run around an amusement park decked out in our Sparkle skirts and Glow necklaces. The staging area was well organized in front of the parking lot. 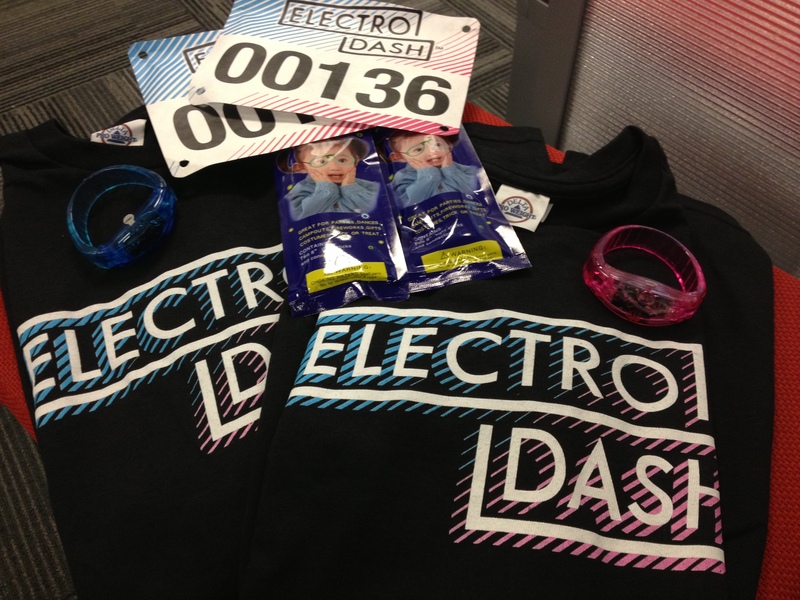 They also had packet pickup for those that could not get their kit on Thursday. I had picked up our kit at the Metro Convention Centre in downtown Toronto. It also was well organized. There were 3 waves advertised for the runners-although, I think they did more. We had opted to take the first wave. The organizers were above us at the start line, along with the DJ who played music. They kept us entertained, even throwing handfuls of glow sticks to the crowd. The Go-Go dancers standing on a platform just outside the corral were a nice touch to set the ‘dance’ mood. Once we were off, we hit the pavement and within minutes we were running through the park. It was fun going through the park at night, however, I felt there were a few dark patches that could have used some lighting or a glowing pylon to indicate ‘danger’. 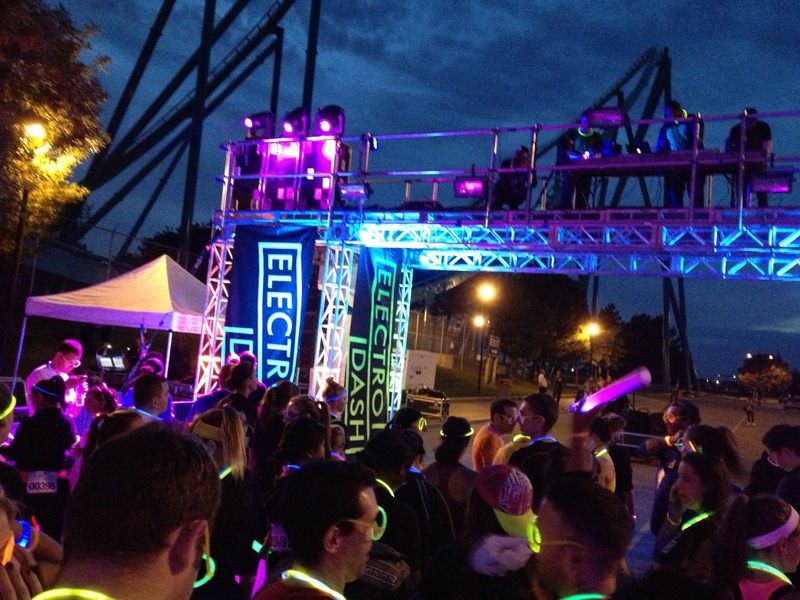 At this time of year, the park is closed during the week, however, the Electro Dash organizers had a few areas on course that were pretty eye catching by way of lighting and special FX. 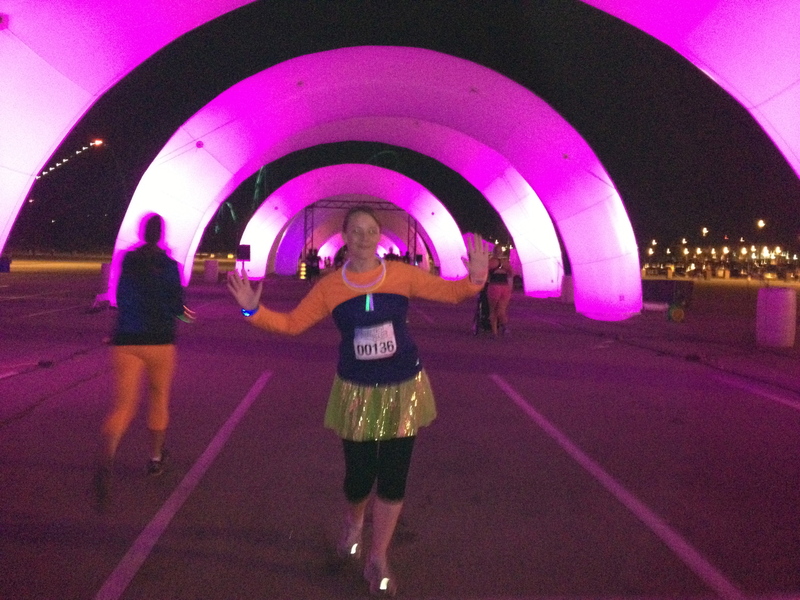 We finished the race by going through large blown up arches, and hearing loud dance music to energize the crowd during the finish. We had fun. It wasn’t a serious race. I went to support a friend and try something new. However, hmmm. I do have one little complaint about the course. It was only 3.5K long! To confirm this, as we walked back to the car, we saw a woman who also wore a Garmin. She was running towards the start line to run the race again in a later wave. So, I guess, the upside was, if you were up to it, you could run a 7K course! We didn’t go to the after party, however, I’m sure those that did had a blast.